Often many families below the poverty line are not fortunate enough to have even one meal a day. As the UNICEF states – “Poverty contributes to malnutrition, which in turn is a contributing factor in over half of the under-five deaths in developing countries.” Some 300 million children go to sleep hungry every day. Of these only eight percent are victims of famine or other emergency situations. More than 90 percent are suffering from long-term malnourishment and micronutrient deficiency. 20% of children aged under 5 suffer from acute malnutrition (wasting) and 48% are chronically malnourished (stunted), according to WHO data. Every 3.6 seconds one person dies of starvation. Usually, it is a child under the age of 5. Sociologists have also discovered that where there is a scarcity of food due to poverty, the rates of petty crime and violence are much higher. In order to address these issues, under the compassionate guidance of Shri Shri Nimishananda, we began the Annadana or Daily Mass Feeding Project in Rajarajeshwari Nagar, Bangalore, where free lunch is provided every day to the underprivileged. More than 10,000 people benefit from this program every month. According to the Times Group, India, there are more than 11 million abandoned children in India as per their survey conducted in 2007. Support structures like orphanages are needed on a large scale to care and nurture the growth of such children. We are sponsoring their total care and education of more than 100 orphans in various orphanages. We also donate blankets, books and other stationery items which are required by these orphans every year. – Shree Public Charitable Trust is always looking for opportunities to support other organisations who are engaged in charitable activities. Our volunteers periodically visit different orphanages to identify and meet their needs. – Our volunteers also visit old age homes in Bangalore to interact with the elderly and bring light and cheer into their lives. 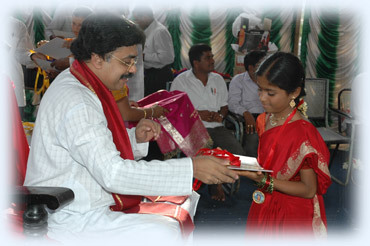 They sing bhajans, distribute sweets and celebrate festivals like Diwali, Pongal, New Year etc. with such old people who often feel lonely and depressed without their families and need attention and loving care.